Orchard House is featured in Dwell:"Top 5 Homes of the Week That Celebrate California Living"
Teaberry is featured twice in Builder Magazine:"Spacious Northern California Master Bath Celebrates the Outdoors" + "Six Trendsetting Kitchens and Baths for 2019"
Laidley Residences building permit approved. Cary is profiled in Indian design magazine iDecorama: "Take5"
Chenery Street Residence wins a 2017 Remodeling Grand Award for exterior transformations. Cary is appointed to the AIA California Council Board of Directors. Cary is a panelist for "Daring Women: Modernists in Architecture" hosted by Flexform SF. Chenery Street Residence wins a Grand Award. Details to be announced in October. Laidley Street Residences receive Planning approval. Cary is a juror at UC Berkeley mid-term reviews. Russell Site featured in San Francisco Cottages & Gardens, "Deeds & Dont's : Master Strokes"
SF Planning Commission approves Laidley Street Residences. Cary is a Juror for the 2016 Remodeling Design Awards. Hill House featured in The Wall Street Journal: "The Land of Facelifts" by Katy McLaughlin. 20th Street Commercial Permits approved. Cary is a Juror for the 2016 Structural Engineering Association of Northern California (SEAONC) Excellence in Structural Engineering Awards. Architektura Assembly interviews Cary for In/Sight. Permits approved for Loma Brewing Company. Cary named to AIASF Board of Directors. Thomas Road Residence Permit approved. Construction to begin November 2015. Permits filed for Loma Brewing Company. Hill House featured in Remodeling: "Cohesive Remodel is King of the Hill" by Stacey Freed. Hill House wins Project of the Year in the 2015 Remodeling Design Awards. Thomas Road Residence Permit filed. Ridge House featured on Houzz (German Ed. ): "13 Sichtschutz-Ideen für Garten und Terrasse" by Christian Benckendorff. Eureka Valley featured on Houzz (Spanish Ed. ): "Ideas para tener un baño moderno más acorde con nuestro estilo de vida"
"Design Trends: Bocce Courts" by Michael D'Angelo. Choy Residence 2 featured in Australian magazine INSIDEOUT: "On Reflection" by Matilda Duffecy. Cary is an invited speaker on the "Architecture and the Arts" Panel at Dwell on Design LA, May 29-31. Cary presents Hill House at Dwell on Design LA, May 29-31. 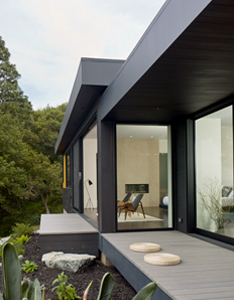 Cary presents Hill House at the AIA East Bay chapter, May 6th. 20th Street Commercial recieves Planning approval. Hill House receives an 2015 IIDA-NC Merit Award. 28th Street Residence owner move-in. "Stealing Sunlight" by Lydia Lee. Willard Street Residence featured in German magazine DETAIL Praxis: "Licht in der Badplanung" by Katja Winkelmann. Chenery Street Residence phase II construction begins. Cary is a juror for the 2014 AIASF Residential Design Awards. 28th Street Residence construction begins. Chenery Street Residence construction begins. Hill House Owner discusses inspiring design on Cool Hunting. Dec. 2013 Cary talks with Custom Home Magazine about Hill House. Tech Professionals Seek Less Flashy Homes. Cary is interviewed by Architizer: How To Start Your Own Architecture Firm: Join Forces With Your Peers. Cary profiled on: The Edge: The Architect and The City. Aug. 2013 Hill House selected for the 2013 AIASF San Francisco Living: Home Tour. Cary will be a featured speaker on the AIASF "Growing a Small Firm" series panel: "What Makes a Successful Partnership? Working Relationships with Other Small Firms" on August 29th. June 2013 Cary will be speaking at the upcoming "Missing 32% Symposium" sponsored by the AIASF on June 8th. Astro Gaming retail shop opens. One & Co receives an 2013 Golden Nugget Merit Award. Building Permit complete for 28th Street Residence. Construction to begin Spring 2014. One & Co published in Office II: Creative & Modern. Could You Live Without Your Shower Curtain? Astro Gaming retail shop construction begins. 28th Street Residence receives Planning approval. April 2012 Astro Gaming tenant move in.